Although lighters are the most commonplace item to smoke with, should you? Many people across the board are concerned about the potential health hazards of smoking with butane. Currently, there have been no clinical studies or tests done on the effects of smoking with a lighter. Obviously, inhaling butane is bad for you, and can result in multitudes of various ailments or even death. Even though there is no hard evidence regarding the effects of smoking with a lighter, the matter is much open to speculation. Some claim that when lighting a lighter all butane released is immediately combusted and transformed into carbon and water. Still others claim that not all butane is combusted and you end up inhaling a portion of it. When smoking a bowl, depending on who is lighting the lighter, they may do so right next to said bowl. When you light a lighter directly next to the bowl you’re about to smoke, it is possible that minuscule pieces of flint are getting all over your weed. In addition, when lighting your lighter near a bowl, it is also possible for excess amounts of butane to end up on your cannabis. Either situation is non-ideal and presents possible health concerns. So, if you are planning on using a normal lighter keep in mind that it’s best to light it some distance from your pipe. All butane related health matters aside, it can’t be denied that butane changes the taste of your ganja. Many people who have been smoking with a lighter for long stretches of time may not notice the change in taste. But if you smoke a bowl with butane, and then another bowl with a nonbutane method, I guarantee that you will notice the change in flavor. While the simple answer is to vaporize, for those of us wishing to take good ‘ole fashioned bong rips we need an alternative. Many people resort to using ‘hemp wick’ or ‘beewick’, which is hemp string coated with beeswax. Although this definitely eliminates the flavor of butane, it is somewhat inconvenient as you have to light the wick and then proceed to extinguish it with every hit. Not to mention when smoking in groups your friends are likely to waste it. Then, of course, there are traditional flameless lighters. These use an electric heating element to heat up a coil or artificial coal. One benefit to using these flameless lighters is that they are completely windproof. Most situations where you can’t light a normal lighter, a flameless lighter will function completely normally. These new lighters run solely off of electricity, taking approximately 1-2 hours to charge via mini USB cable. Once fully charged it’s good for approximately 100 lights before needing to be charged again. While there is a shockingly small amount of information on the subject, it seems like incredible breakthrough lighter technology. Especially considering the fact that they are butane free. To take a look at the currently two largest electric arc lighter distributors check out these links, ArcLighter and ElementiumLighter. And of course, every futuristic lighter needs a fancy bong. But what is it about these fancy bongs that draws us so? Of course every true stoner is always on the lookout for a new bong (usually because the last bong they had broke). Some are content to stick with their classic spoon pipe or chillum, while others spend hundreds and sometimes even thousands of dollars on a new smoking rig. But the real question is, why? There are a few reasons why bongs are the best smoking method. Studies involving marijuana are somewhat rare. However studies involving tobacco have proven that smoking through water helps filter out carcinogenic compounds smoke contains. A 1991 study involving marijuana smoke, showed that water filtered out cytotoxins which have been shown to impair immune cells. So if you or someone you know is living with an immunodeficiency it is recommended that they smoke through a water pipe such as a bong. The water also cools the smoke, resulting in less potential throat/lung damage via heat as well as a smoother hit. 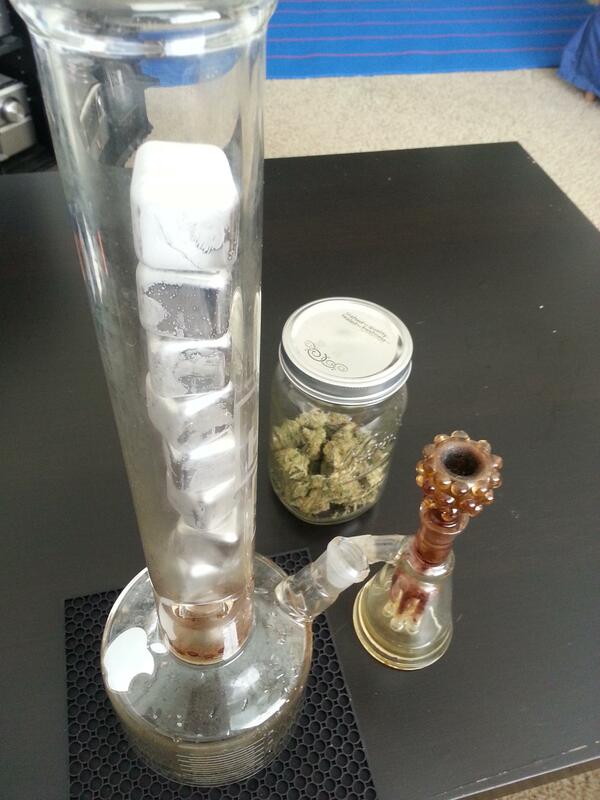 Not to mention the fact that many bongs have ‘ice catchers’ built into the stem allowing you to fill it with ice. This results in even less potential throat/lung damage as well as an even smoother hit. The amount of weed you can smoke in a single hit is greatly increased when using a bong over a pipe. When smoking out of a bong you are able to take massive hits, depending on your lung capacity and level of experience. This can be very desirable for people who have high tolerances or for people who just want to get really really high. You wouldn’t want to light your prized Cuban cigar with a butane lighter, so why light your fancy bong with one? !